Friday, March 15th, 2019 at 11:24 am. Friday, February 8th, 2019 at 2:39 pm. Our Supporters Network engages BWCE members and non-members alike in reaching out to the wider community to mobilise more people around community energy and climate change action. Our two working groups (CoCO and Technology) have been meeting regularly to develop various activities including information briefings, stories of success, visual displays, educational workshops, public events and research into local use of renewable energy technology. As well as a session on Climate Conversations we will be hearing about the ideas coming out of the working groups and providing you with a chance to support these activities. In addition, we will be discussing how we can all promote the new BWCE share offer to provide a chance for as many people as possible to invest in community energy. For more information on the Supporters Network contact [email protected] or call 07517 100889. Friday, February 8th, 2019 at 2:34 pm. 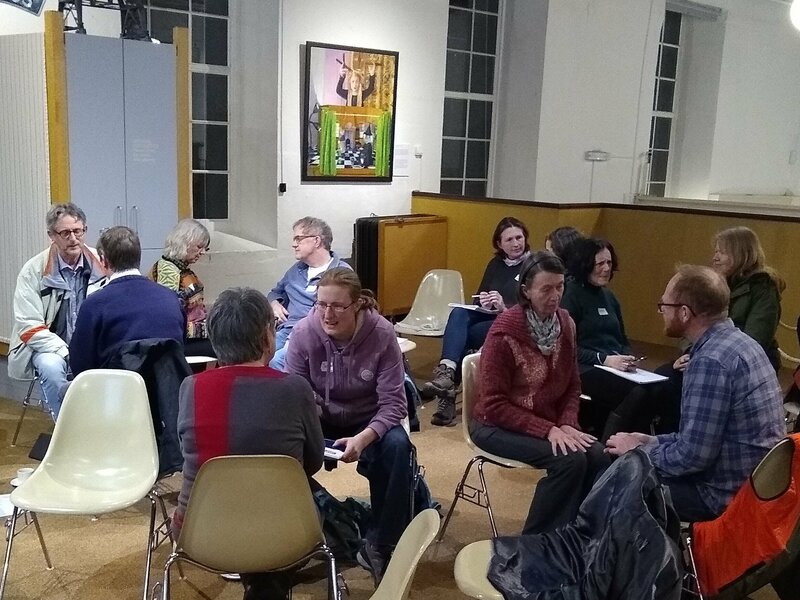 On Thursday 31st January, despite the arrival of snow, 30 people attended our ‘Taking the Heat out of Climate Conversations’ workshop at the Museum of Bath at Work. Guided by facilitators Susan Johnson (Zero West) and Paul Hoggett (Climate Psychology Alliance) we explored how to have more positive climate conversations with friends, family, neighbours and work colleagues. It was a practical workshop, mixing small group conversations with input on psychological theory to help us explore the resistances and ethical dilemmas we encounter when trying to talk about climate change. An online platform has been set up to enable participants to continue to share experiences and the topic will be re-visited at our next Supporters Network meeting on 21st March 2019. Friday, February 8th, 2019 at 2:32 pm. BWCE’s asset management services have transferred to Bright Renewables, a new business wholly owned by its community clients. Bright Renewables acquired Mongoose Energy’s asset management business with financial support from Community Owned Renewable Energy LLP which is funded by social investors Power to Change and Big Society Capital. Mongoose Energy will be wound up in due course, once it completes the sale of its assets and settles any remaining obligations. The first clients and owners of Bright Renewables are all former Mongoose Energy members, including BWCE, but new community clients will be joining shortly. Mongoose Energy’s asset management staff also transferred over to the new business. We are delighted to be part of this new community owned enterprise. Becoming 100% community owned was always part of the Mongoose Energy plan. We are pleased to see that vision coming to fruition. Friday, February 8th, 2019 at 2:22 pm. 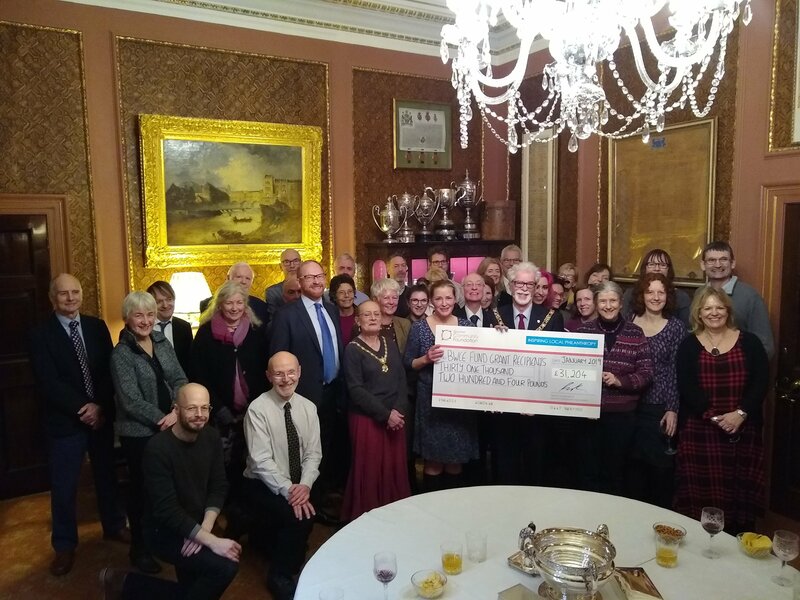 On the evening of Monday 28th January 17 Bath area community projects which have received funding through the Bath & West Community Energy Fund plus BWCE Fund trustees, BWCE trustees and Quartet Community Foundation staff joined the Mayor and Mayoress of Bath in the Mayor’s Parlour in the Guildhall to celebrate the achievements of the fund. This year 11 community organisations have been awarded over £31,000 for projects ranging from improving the energy efficiency of community buildings, sharing and repairing items, promoting the use of electric bikes, recycling, reducing the use of plastic bottles and planting a community orchard. Friday, February 8th, 2019 at 11:21 am. As many of you will have seen in the press, Our Power, our local energy supply partner, has ceased trading. We heard about this when it was first made public. See here for Our Power’s announcement on their website. We were deeply disappointed and saddened that our partnership with Our Power, to supply electricity from our projects to local people, has come to an end in this way. Ofgem have just issued a press release announcing that Our Power customers have been transferred to Utilita, see here, though people can switch away to someone else if they wish. Ofgem also provides answers to common questions and advice about what to do, including switching, here. Contact details for further information can be found in the links provided and/or the email from Utilita for those that have been directly affected. We still believe in the approach to supplying local energy that we developed with Our Power and B&NES Council, and over the coming months we will explore how best we can continue to deliver local power to local people. Thursday, December 6th, 2018 at 1:05 pm. We will soon be opening a new share offer to enable us to continue raising capital to deliver new community renewables projects, including new community solar PV roofs and our innovative Solar Streets pilot, that includes installation of domestic solar PV and battery systems. As some of you know from recent discussions, we are not in a position to raise new finance with the same target interest rate as previously, especially in light of the ending of the Feed in Tariff in April 2019 for new projects. So we intend to launch the new share offer with a target interest rate of 4%, potentially rising to 5% as new markets develop over the next few years, and with a minimum purchase of £100. We will of course continue to honour all past commitments to our existing shareholders with regard to target interest rates. We are bound to meet the terms of all previous share offer documents and neither we, nor any future board can vary these terms in the future. But we do hope you will be able to support the offer when it opens. We hope you will be able to help us continue to grow and increase our impact. We will be heavily marketing the offer in our area to increase local membership, so please spread the word! Latest reports about climate change tell us that we need an urgent and rapidly escalating response to carbon reduction. We need to make our voices heard, let our leaders know through positive action that there is real demand for an ambitious response that is proportionate to the threats we face. What better way to do that than by ensuring your positive action supports a local community business committed to delivering community benefit rather than commercial profit. Monday, December 3rd, 2018 at 11:22 am. The Communication, Creative and Outreach (CoCO) group will hold its first meeting on Monday 3rd December (followed by a second on 10th January) to explore how to promote climate conversations and raise the profile of BWCE and sustainable energy activities. The Technology group will hold its first meeting on Thursday 6th December to explore how to increase understanding of the technical challenges and solutions to climate change and how we can develop a community owned clean local energy future. Sunday, September 16th, 2018 at 4:49 pm. BWCE is embarking on an ambitious plan to build better awareness of our work across Bath and the surrounding area and to develop the networks and partnerships we need to promote new community energy and low carbon initiatives. At our recent AGM, we managed to gather lots of ideas of who we should be talking to through a community mapping exercise and we now want to build on this. Central to this venture will be the development of a Supporters Network. This will comprise a network of people interested in helping BWCE promote what it’s doing – from forwarding on emails/social media to creating new connections and having more conversations with more people. A number of members have already expressed an interest in being more involved in supporting BWCE. We are now inviting members and non-members to join us to explore what we can do together. Discuss the Supporters Network – what’s it all about, what are we seeking to achieve? Explore some of the ways you can get involved, from simply sharing our news to a more extensive involvement for those with the time and inclination to do more. Present the community map and plan how to use it and develop it further. Explore what information and support you need to be effective. Decide how we communicate and keep in touch with each other, without burdening you with information and meetings! Come along even if you just want to find out more. Attending the meeting will not be a commitment to do anything! In order for us to get a sense of numbersit would be great if you could let us know you are planning to attend, please email [email protected]. If you want to discuss the meeting before attending you can call Nick Bird (BWCE Communications and Community Outreach Coordinator) on 07517 100889.